Whether you're looking for a small thank you gift or holiday office presents, a Black & White Triangular Gift Box with Chocolate Almonds is the ultimate sweet reward. Make this Chocolate Almonds & Sea Salt Caramels a part of your holiday gifts or thank you giveaways for a memorable sweet reward. Treat the office to a gourmet, heavenly surprise with a Copper Classic Treats with Sea Salt Caramels to delight their taste buds. Treat the office to a gourmet, heavenly surprise with a English Butter Toffee in Red Gift Box to delight their taste buds. 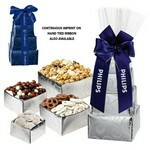 Whether you're looking for a spectacular thank you gift or holiday office presents, a Executive Gourmet Tower is the ultimate sweet reward. 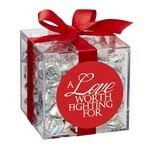 Our Gift Box with Hershey Kisses has more than 1 pound of the delicious chocolate treat in an attractive square box. 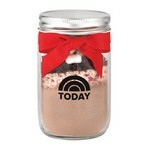 The Hot Chocolate Kit in Mason Jar is made fresh when you order and makes 4 servings. 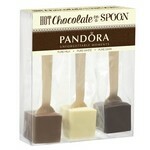 Our Hot Chocolate on a Spoon Gift Set is a 3 pack of chocolate to mix in with either hot milk or water. Treat the office to a gourmet, heavenly surprise with a Silver Gable Top Gift Box with Chocolate Covered Almonds to delight their taste buds.